Pierce starts school later this week, so I decided to give him an end of summer Muffin Tin Monday. 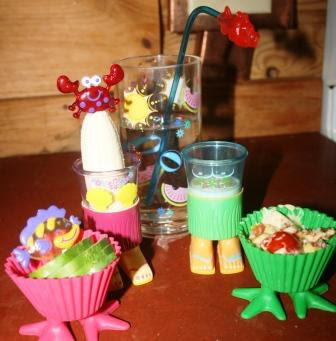 From left to right, a duck feet muffin cup filled with cucumbers (and a fish pick), a banana in a tiki lady cup (with a crabby head), a glass of water with a fish straw, ranch dressing (for dipping the cucumber) in a tiki man cup, and a duck feet cup of tomato pie. Lots from the garden this week! We're really enjoying all the tomatoes. Is it wrong that I want duck feet muffin cups of my very (adult) own!? Such a cute way to end the summer! Glad to hear he made it into the fours program. The bus would make nervous ! That is the cutest lunch I've ever seen! You are a fun Mom! Pierce probably won't ever be so happy with school lunch! My tomatoes are very late this year. So far I have a lot of green ones. Can't wait to get eating them. Your serving cups are simply adorable. What a fun meal! Happy MTM my dear! You did a great job with this and looks awesome! That is the cutest lunch! I saw a recipe for tomato pie a few weeks ago and have been excited to make it, though my husband is skeptical. My tomatoes are just coming on. That banana is probably my favorite. I think I need to get on the tomato pie bandwagon. We used our silly feet muffin cups this week. I never saw the duck ones before they are really cute!!! I love all your fancy cups. Never heard of tomato pie. We've been getting tomatoes out of the garden, but they have been very small due to the lack of rain last month and the heat. Still scrumptious though. I really love your back to school lunch. Thank you so MUCH for sharing YOUR wonderful story with me over on my blog. You are a lovely, special person and I'm glad I am getting to know you. So cute and healthy too! How can a kid not want to eat from such cool serving containers! I hope Pierce is looking forward to school. Is this his 1st year? You ARE a fun mom and smart to boot. I'll bet he ate all that right up. I need to get more creative to get the vegetables in them. This is such an adorable lunch. You are so creative!! whooo i love the duck feet muffin cup! I saw you over at Jill's and wanted to come and say hello! Nice blog...cute kids...talented mom. Wonderful! The end of summer is so bittersweet, but what a fun way to end it. I can't wait to see what you come up with for fall! love the muffin feet! so very cute! SUPER CUTE! And surely yummy, too! This is so cute! I Bet your son LOVED his lunch! !